Iron, brass, copper and aluminium. Past materials aside clearing the way to a new modern style which Prem Line roots from. The graphic stains mixed with a special reflection made by an innovative Prem Line tecnology confers a special full-new visual effect. Perfect for contemporary alternative interiors, Metal™ Collection owns aesthetic strength and excellent performance with its highest classification of chemicals and solvents resistance. 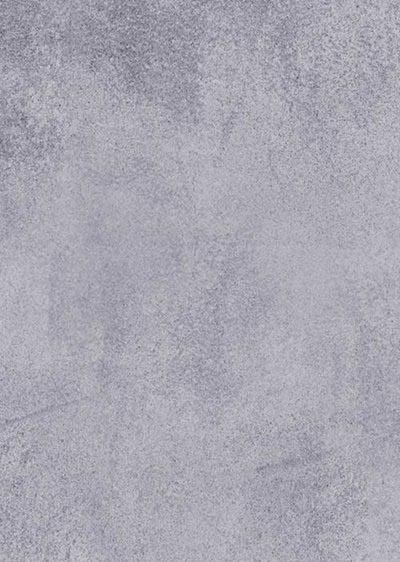 The extremely matt surfaces is characterized by the unmistakable effect you can touch. 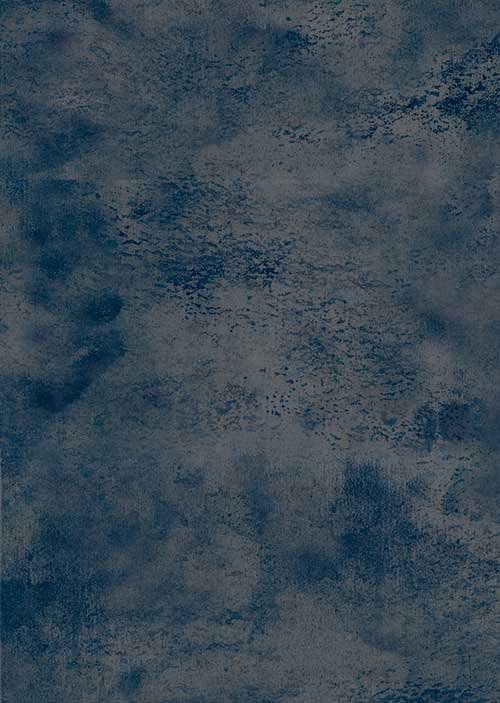 This is one of the most important properties of surfaces. 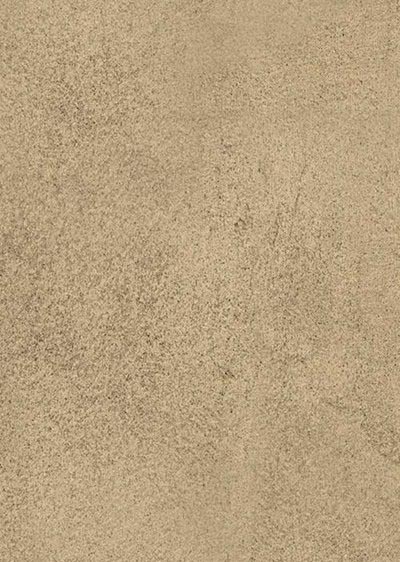 The surfaces must be resistant to the stresses of use and cleaning, made to last during the time. 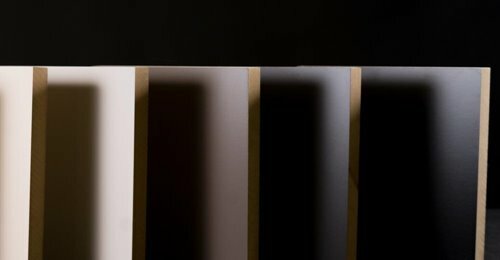 With the highest degree of wear resistance (UNI EN 15186:2012 DIN 68861:2013 part.4), Prem Line Surfaces are protected by a special nano-technological treatment that makes them the leading product for architecture. The Surfaces provides a very high resistance of chimicals and solvents. Beauty and reliability are values that we consider strategic especially for our Partners. Prem Line Surfaces have no colour changes over the time neither contain any volatile substances which may cause unforeseens after their installation. Stain-resistant, solvents and water proof, all surfaces are designed to be easy to maintain. You can use the most common cleaning detergents and also solvents such as acetoneit. 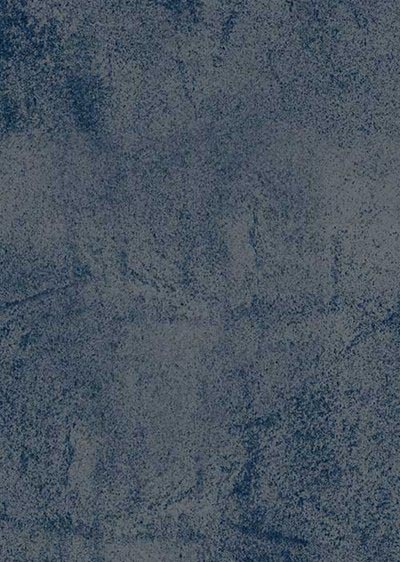 The special nano-technological surface treatment vitrifies PET and thanks to the very closed-pore layer it does not hold dirt, dust and prevents the mites. 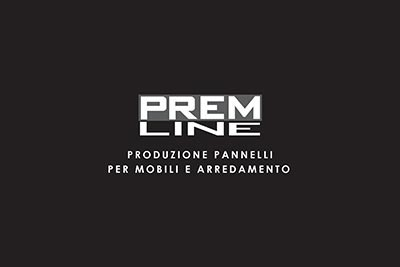 All PREM LINE Panels are branded and they have identification code with production batch for allowing traceability. 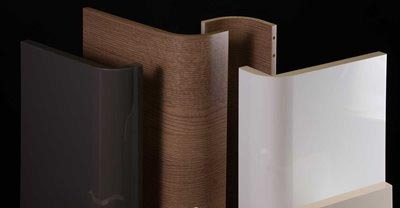 Prem Line produces Surfaces with unique features without forgetting the environment. All Prem Line products also comply ith the most restrictive regulations, do not give out dioxin and are PVC-free. Metal is available in 5 colours. 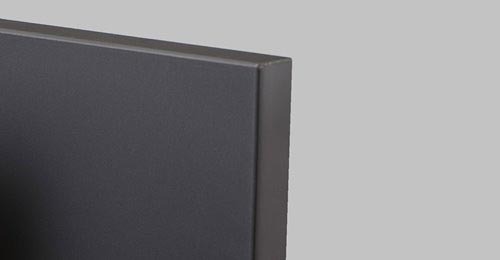 It's the heat lamination of a PET foil (PET-Prem™ ) on a panel. Cutting to size process of the board. You can use different machines but we suggest you to use cutting machines with blades with diamond inserts because in this way the sharpening is more resistant and allows a longer life. For a better warranty of quality of the finished product, we suggest to make the processings in clean environments with adequate suction system. 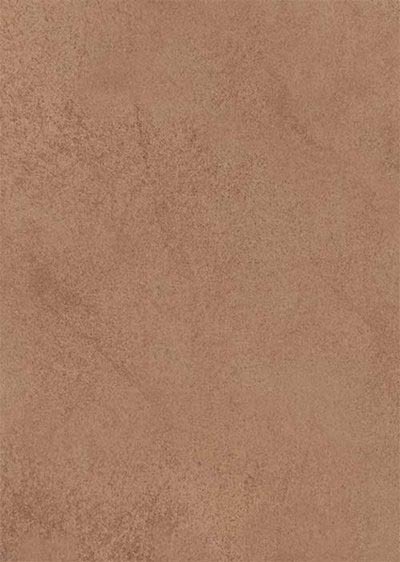 Prem Line Surfaces are supplied also with matching edgetapes. 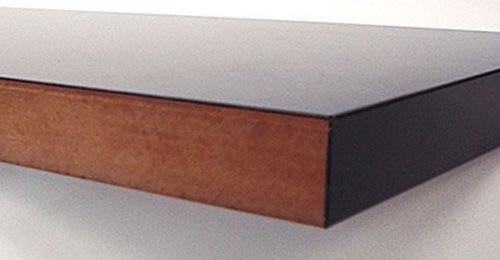 The best solution for a good quality and long lasting edgebanding is to use a polyurethane glue (PUR). 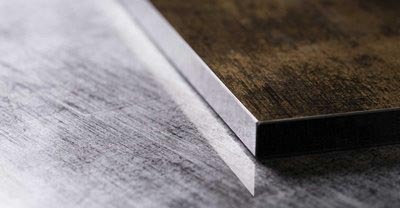 Edgebanding can be made starting from a thickness of 8 mm. Edgetapes are available in PET and ABS. It's the coating process of the edges made during the lamination. 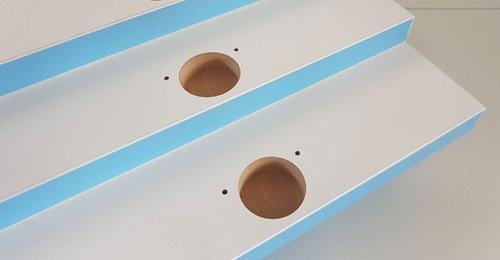 The coating material sticks out the width of the board and then it is shaped and glued on the edge using heat and shaped wheels. 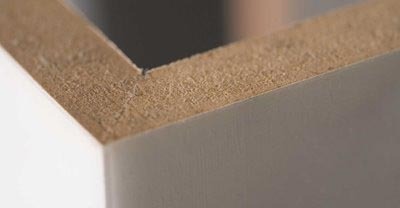 Available for boards or profiles, 1 or 2 sides postformed starting from 1 mm radius. The folding process consists on the cut on the backside of the board with a 45° angle. This process creates some grooves that allows the panel to be folded. In this way you can create light elements with very high thicknesses. Custom-made drillings are made using … machines. They are made to insert hardware (handles, hinges etc). Milling is a process to remove material. Profiles are made with inclined shape WITHOUT JOINTS. 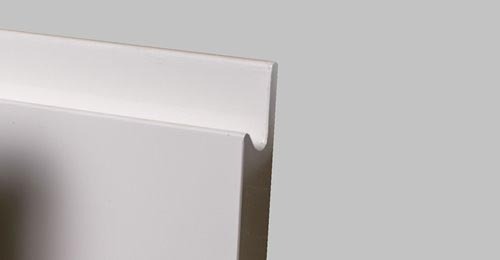 With 30°, 35°,45° and adjustable angle profiles are available in 1 or 2 shaped sides in all the thicknesses. 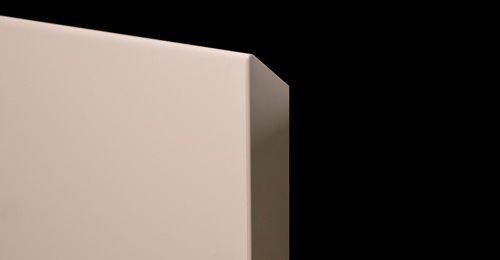 Profiles are made with J handle shape WITHOUT JOINTS. Available in 19 and 22 mm thickness. Bending processing can be realised with thin panels. Process made through grooves on the Surface that creates the effect of staves. Process that allows a stamp on the Surface. 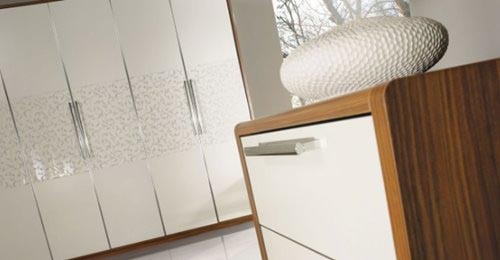 PET Innovative Surfaces and semi-finished components for furniture. 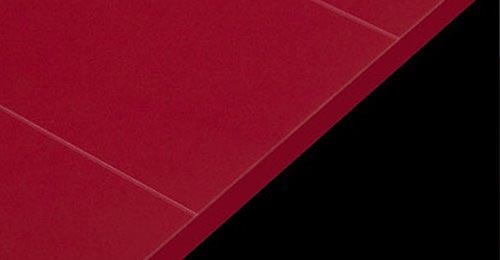 High Gloss, matt and structured panels for domestic and commercial environments: kitchen, bathroom, residential, hotel, shop fittings and motor home.